To commemorate their 50th anniversary, Sesame Street is taking to the streets of the United States to meet kids in their own neighborhoods. From February until December, the beloved muppets will leave Sesame Street to travel cross-country and interact with their fans young and old, symbolizing the spirit of Sesame Street: that it’s for everyone, everywhere. Sesame Workshop will also publish a study on the state of children and their families in an effort to provide insight into how they can continue to support them. Here at FableVision, we’re celebrating by looking back on our collaborations with Sesame Workshop. From online interactives to live action videos, the media we created further Sesame Workshop’s mission to help kids grow smarter, stronger, and kinder, and we’re proud of the creativity and teamwork that was involved. Modeled after The Oprah Winfrey Show, The O Show is an animated short FableVision created for Sesame Workshop to help preschoolers build letter recognition skills. The host of the segment, our friend “O,” interviews her orangutan buddy, Otto, about about his breakfast filled with “o” foods, and an octopus pal, Ophelia, about her food-flinging juggling. The segment, aimed to help preschoolers learn a letter of the alphabet, includes elements of humor that parents can appreciate as well. Voiced by Oprah Winfrey herself, The O Show is a delight for parents and kids alike. Follow the adorable antics of four-year-old Victoria and one-year-old Otis as they count six blocks and a fox in Sesame Studios’ The Silliest Counting Show. With story, script, and graphics created by FableVision, and original music and live-action footage produced by Big Breakfast, The Silliest Counting Show was destined to be a lighthearted, fun-filled success. As Victoria plops each of the six plush squares in front of Otis and counts aloud, Otis eagerly pulls each one into his lap and giggles as he tosses them back to the carpeted floor. The live-action video is fun and silly while promoting early counting skills, patience, and problem solving. Victoria knows Otis is little and just wants to play! Ever-patient Victoria keeps counting and laughs along with her friend, collecting the blocks off the floor as she goes. After she is done counting to six, Victoria hands Otis a plush fox and both giggle. The quirky video is available for enjoyment on the Sesame Studios YouTube channel. I bet you didn’t know a zebra, penguin, and skunk could teach a kid about engineering! In Zebra Penguin Skunk: Beach, Penguin, Skunk, and Zebra put their minds together to solve a common beach day problem. Penguin wants to build a sandcastle, but all castle-building efforts are thwarted by the ocean waves. After Skunk comes along with a shovel and helps Penguin rebuild, another wave comes crashing through and knocks down the new sandcastle. As Penguin and Skunk sit sadly on the shore, Zebra wanders over and builds a wall out of sand. The three create a beautiful sandcastle behind the wall, and it is finally safe from the waves. The cute and inspiring short video emphasizes the importance of teamwork, perseverance, and problem solving. FableVision team members brought together the script, story, animated title card, and motion graphics, and the studio enlisted the help of Duncan Studio to create the colorful, soft animation of the beach scene. Spin the wheel to play HTML5 interactive games “Grover’s Playground Workout” and “A Little Help From My Furry Friends” on Sesame Street in Communities, a free online resource for parents that provides information on how to best support children 0-5 and provides activities for those children to help them learn and grow. 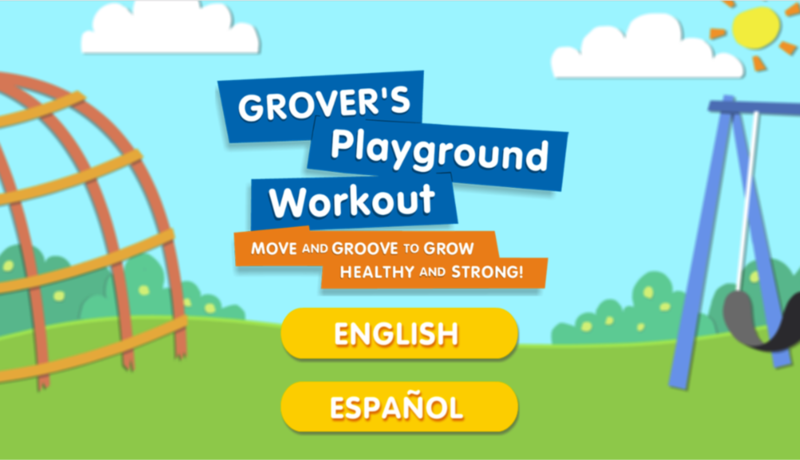 In the game “Grover’s Playground Workout,” FableVision artists animated Sesame Street monsters and arranged them on a spinner, so kids can either click the spinner to select a monster at random or choose a monster they like best. Once a monster is chosen, that monster displays three different physical moves that kids can follow to practice healthy habits! “A Little Help from My Furry Friends” utilizes the same spinner model, but the spinner is designed to land on a topic related to stress or coping: notice, imagine, count, move, hug, and listen. When the spinner lands on a topic, a video pops up on a separate screen and features a monster discussing the topic. With the help of a Sesame Street friend, feelings don’t have to be scary! Check out Sesame Street’s 50th anniversary campaign #Sesame50 here and take a peek at our full portfolio to see the other amazing projects our team has created.